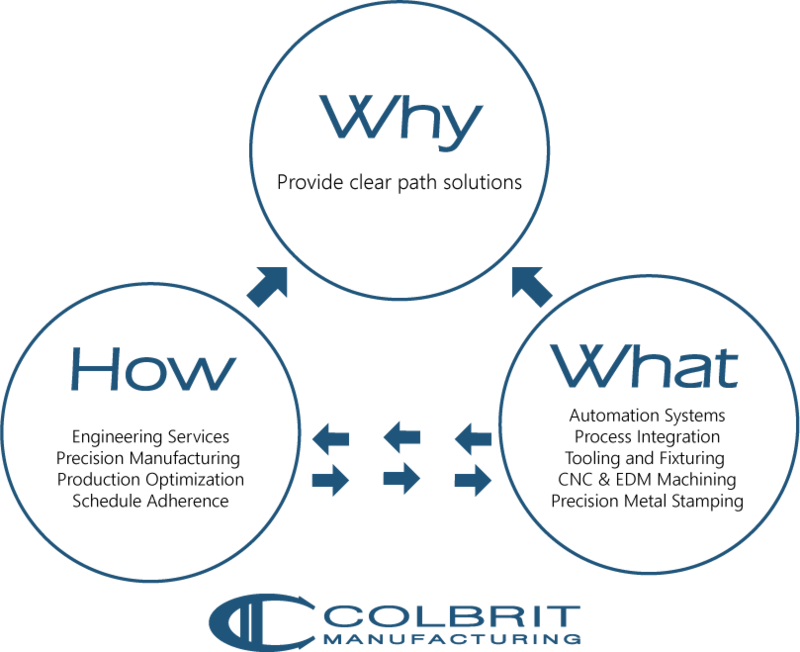 Colbrit Manufacturing Incorporated was founded in 1979 with but one mission- to provide high quality, cost effective solutions to our customers’ most demanding manufacturing challenges. As a result, our services- which include engineering services, process automation, tooling & fixtures, tool & die making, mold making and CNC/EDM machining- are all designed to solve those most difficult challenges others prefer not to tackle. To further ensure our ability to achieve our mission, we have brought together a highly experienced team of engineers, designers, master tool & die makers, machinists and technicians. We have backed that team with a full complement of advanced tooling, machining, stamping and quality control equipment. At Colbrit, we offer services in five major categories- Engineering Services, Process Automation, Tool & Die and Mold Making, Precision Metal Stampings and CNC/EDM Machining. Though most of our customers take advantage of our ability to deliver a turnkey project from design through finished product, we also provide each of these services individually or in any combination as required.